Born Pretty Store sent me some really gorgeous water decals to try out. I picked the rainbow rose pattern because I am a sucker for rainbows! I decided to try them first over Julep Margaret to see how opaque they were. I'm thrilled that they aren't at all transparent, but I wasn't a huge fan of them with the blue. So I decided to try them again alone and loved the result much more! I was extremely surprised by these. They were much harder to place than full-nail decals or smaller images. You have to align them properly and make sure they stay perfectly in place while they dry. It took me about an hour to do them on just one hand, which is really rare. Typically it takes me no more than 20 minutes to apply decals to both hands! I had to be really careful with my topcoat, too, because they had a tendency to pull and tear off on the ends when I put topcoat over them. You can tell I started with my pinky, because I got better with the topcoat as I went. If you're very careful with these, I would definitely say they are worth the effort, though! They are gorgeous, I absolutely love the pattern! They're $2.86 and you get plenty of decals for one full mani plus a few extras. 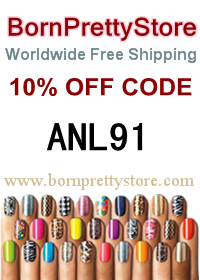 As always, if you shop at BPS, you can use my coupon code ANL91 and you'll get 10% off!